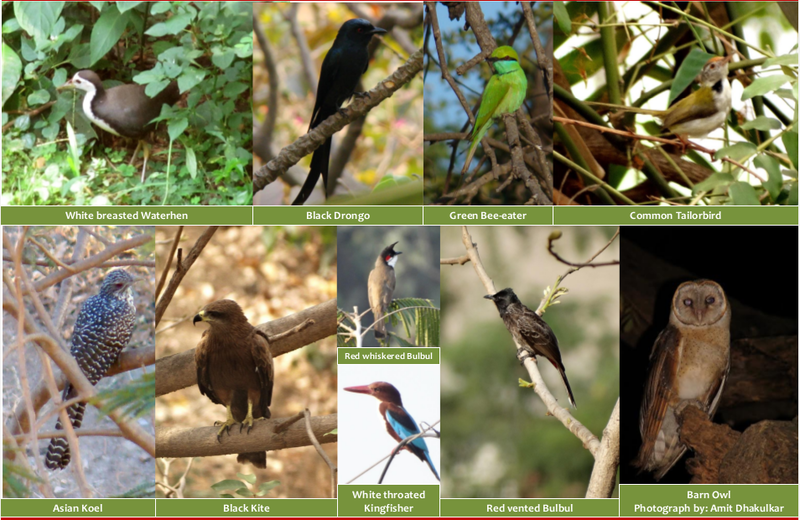 HBCSE campus supports a rich and diverse group of birds. Some species are seen nesting at regular intervals. The trees here provide nesting spots for various birds like crows, pigeons, coppersmith barbets and sunbirds, while the shrubbery and dangling creepers provide nesting spots for tailor birds, bulbuls and babblers. Predation of purple-rumped sunbird nests have been observed on several occasions. Usually, mornings and evenings are good times to do bird-watching. But since the campus is green, shady and quiet, one can even sight birds during the afternoons. They are seen bustling around shady shrubs and trees. Some birds like warblers and red-breasted flycatchers which are migrants are not seen throughout the year, while others like coppersmith barbets, purple rumped sunbirds are seen all year round. Why do we see less bird activity during the afternoons? Why do male and female birds of the same species look different? Wouldn’t the bright coloured birds attract predators faster? Does a bird-call of the same species remain the same throughout the year? 1. Do not make sudden movements or gestures when you sight a bird. 2. Take small steps and walk without making a lot of noise. 3. Pay attention to bird calls, often you can identify which birds are in the vicinity by just listening to their call. 4. Observe bird morphology and behaviour carefully. It may help in identification of the species later. 5. Keep a note of the season/month in which you sight the bird. 6. Extremely bright coloured clothes may alert birds of your presence. 7. A pair of binoculars may help you get a better view of the bird. from where does the pistol shrimp get its name?